What Free Crypto Tax Software is There? In this guide, we identify what free crypto tax software is there, as well as what services they provide. To start off with, we introduce the benefits of using free and readily-available services, benchmarking them against tax self-calculation. Finally, we review top free crypto tax platforms that help users manage crypto accounting books, including Cointracking, Cryptotrader.tax and BitcoinTaxes. Using crypto tax software has several advantages due to the nature of the trading sector. Cryptos rapidly change in value, meaning that self-developed (a.k.a. excel) reports would be tedious and difficult to maintain. Having an option for a bot to sort out your data can thus save you an immense amount of time. Additionally, free crypto tax software offers reports on multiple cryptos, not just your bitcoin tax obligations. Having a cryptocurrency portfolio management program working for you leaves ample time for trading activities instead. Cointracking is a platform that offers several features for crypto beginners for free. Firstly, you have the option of registering an account and immediately starting to import data into the platform. Reports are quite flashy and provide a good statistical analysis if you happen to trade on several trading sites. Thus, Binance tax calculations, for example, would be shown separately from Coinbase. Crypto tax calculator, as well as various tracking features, is available. These include data import, trades, and coins tracking. Take note that tax and capital gains reports are available as a preview only. Otherwise, it is possible to download other reports regarding your crypto taxes and profitability. Cryptotrader offers similar services that exist within BitcoinTaxes and Cointracking. However, its interface is really sleek, as you can track down your profitability, trade history, and taxes as well. Simply import data from numerous trading platforms and let the software do the tax calculations. You also have API keys that protect your account, since information there is quite sensitive. On the con side, it is not possible to download reports, as it is with the free versions of the other two platforms. You need a premium account to do this. BitcoinTaxes takes a bit more of a simplistic approach to crypto tax reporting. Its interface shows exactly the data you need, though with a much smaller number of charts than Cointracking. However, its free program includes numerous platforms from which you can import data and calculate your bitcoin taxes. 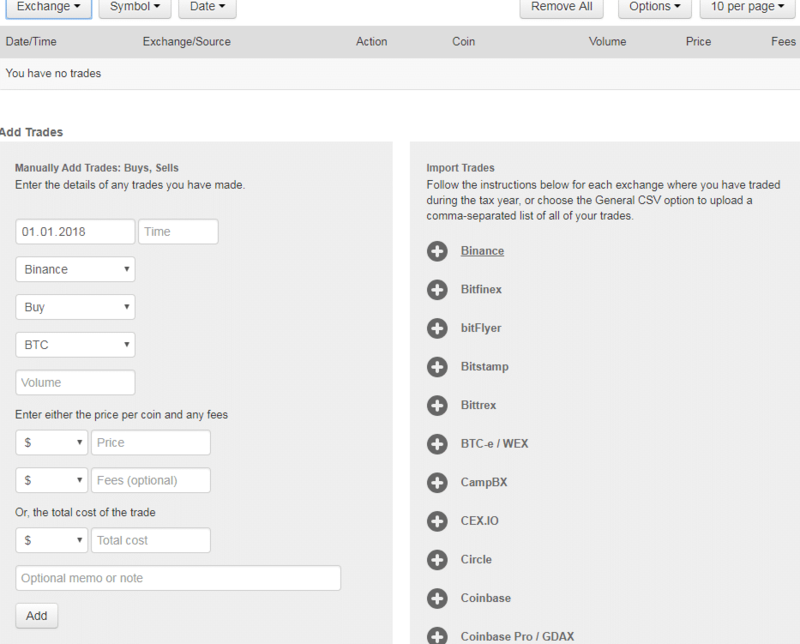 The below picture represents the report, where you can choose the type of currency, exchange and time of trades. Additionally, you also have the ability to contact a crypto tax accountant should you have a specific question on your mind. However, take note that the feature is demo only and for constant advising services, only premium accounts are available. It is possible to download reports in this platform however. In this article, we’ve provided an answer to what free crypto tax software are there. By comparing three top platforms, it is evident that good numbers of services are currently available for crypto tax reporting. However, tax accountants and other, more business-like products remain to be premium features. Be sure to read our article on platforms that offer a premium portfolio for a more comprehensive view of what these services offer.